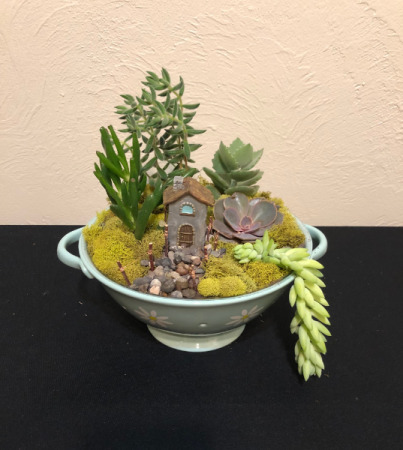 This adorable cottage sits atop a landscape of succulent varieties and moss in a ceramic colander. Call the shop for care suggestions and other questions at (208)323-7738. This gourmet wine basket features a single bottle of Rose Crest Vineyard's Evening Retreat 2016 blend, bottled by Hat Ranch Winery in Caldwell and fruit, crackers, cheese, sausages and pistachios. 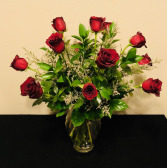 Rose Crest Vineyard is an up-and-coming, local, family owned, Idaho vineyard. Their 2016 Evening Retreat features a blend of Merlot and Marquette grapes for a smooth mouthfeel, subtle hints of plums and blackberries with a dry finish. 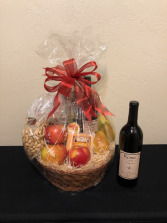 **This custom wine basket features items that contain alcohol so all purchasers and recipients must be able to provide a valid Driver's License and be at least 21 years of age. 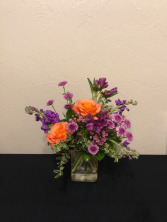 Please call the shop at (208)323-7738 for questions.